The Nicolet Watch Super Waterproof chronograph comes in several variants, with various types of dials and glasses. Their common points: a steel case with a very respectable diameter of 38 mm excluding crown and a Landeron 39 movement, with column-wheel. And a stunning wrist presence. Case: in steel, never polished. It has some scratches but nothing excessive and the angles are sharp. Glass: in plexi, he received some "pocs". It may deserve to be changed. 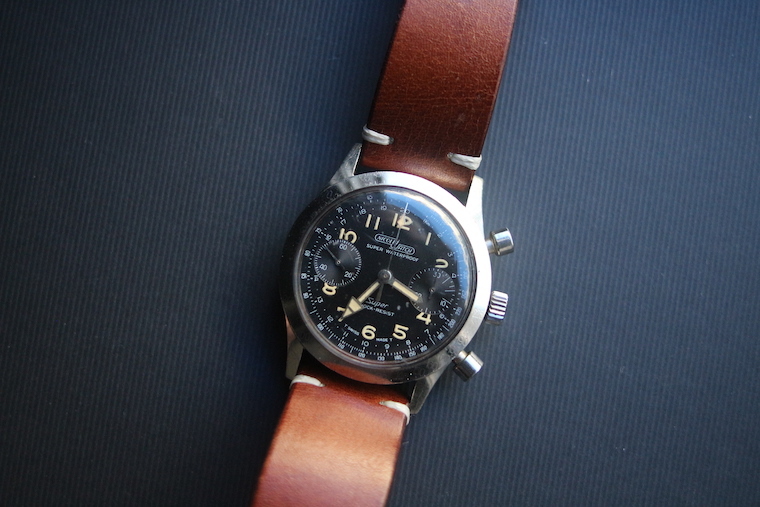 Dial and hands: in perfect original condition, the tritium having taken on an egg shell colour. Accessory: the watch is accompanied by a vintage style leather strap made to measure for its 21 mm horns. Mechanically, no revision history but the Landeron 39 movement works fine. The power reserve and timekeeping are within the norm. All the functions of the chronograph are operational and the reset is carried out perfectly. I expect 2000 EUR for this rare bird in really nice condition. The watch and I are in Paris, France.